"In Space, No One Can Hear You Scream." Long before Prometheus, Predators, and even poor Newt, Ridley Scott's ALIEN blew open the space doors for sci-fi horror. 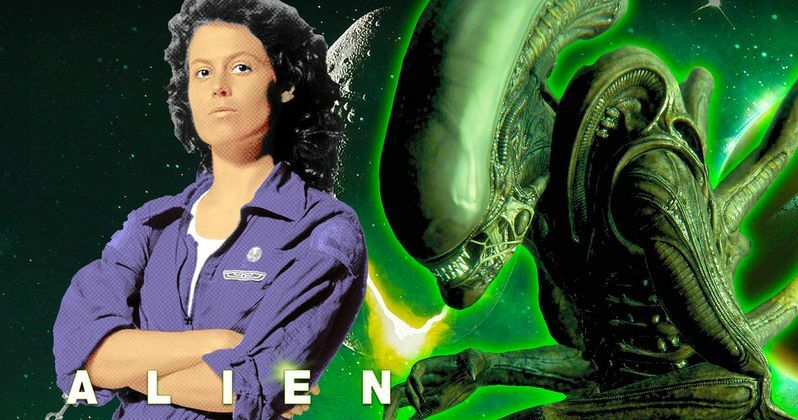 Here we'll take a look at 10 Things You Never Knew About ALIEN. The story behind experimental filmmaker Alejandro Jodorowsky's cancelled adaptation of Dune is the stuff of movie legend, lovingly detailed in the 2013 documentary, Jodorowsky's Dune. Dan O'Bannon, who co-wrote the 1974 sci-fi comedy Dark Star with John Carpenter, was hired to supervise the special effects for Dune, where he also worked with Swiss artist H.R. Giger. When Dune collapsed, O'Bannon found himself sleeping on the couch of another writer, Ronald Shusett. O'Bannon would eventually reassemble much of the artistic team from Dune for ALIEN, including Giger, Ron Cobb, Chris Foss, and legendary French artist Moebius. O'Bannon showed Shusett a script he'd started back in 1972 but had never finished. Memory was about a group of astronauts who are awakened by a signal from a mysterious world and decide to investigate it. For the second half, Shusett suggested O'Bannon incorporate another of his ideas, a story called Gremlins, about soldiers on a B-17 bomber fighting off gremlins over the Pacific during World War II. O'Bannon typed out the script, first called Star Beast, intending to produce and direct himself and envisioning an H.R. Giger style monster. Shusett came up with the way the creature gets onboard the ship via face-hugger. He pitched Alien as "Jaws in space," aided by illustrations by Dune era O"Bannon pal, Ron Cobb. Director Walter Hill came onboard as a producer. He and another producer started rewriting the script, condensing some scenes, polishing some dialog, and adding the android. An avid genre fan, O'Bannon proudly wore his influences on his sleeves. As he once joked, "I didn't steal ALIEN from anybody. I stole it from everybody!" There's the 1953 short story, "Junkyard," where astronauts find a chamber of eggs. 1965's Planet of the Vampires features the discovery of a huge alien skeleton. 1951's The Thing from Another World featured a similar alien vs. professionals chase; 1956's Forbidden Planet sees a crew picked off one by one after ignoring a warning. The success of Star Wars gave 20th Century Fox the confidence to make ALIEN, but Hill decided to make the movie The Driver instead. The Directors Guild went on strike shortly after, which left the project without a director for some time. Ridley Scott was on the top of the list of suggestions from the studio. He saw the movie as "The Texas Chainsaw Massacre of science fiction." He was drawn to the original script. While there was some considerable back and forth between the producers, O'Bannon was awarded sole credit by the Writers Guild. He eventually got his own turn in the director's chair, with the 1985 cult classic The Return of the Living Dead. The alien's famously corrosive blood came from the mind of Ron Cobb. "He gave continual input to the film right from the very start," O'Bannon said in an in-depth interview with Film Fantasy Magazine, conducted before the movie's release. "One of the reasons the monster can't be cut up or fired at is that its blood would eat right through the ship. That was Ron's idea and I want everyone to know it." In that interview, O'Bannon admitted that ALIEN no longer felt like it was "his." When pressed to point to a specific change, he explained that in his script, the team would find a crashed spaceship with a dead alien crew, return to their own ship to contemplate what could have happened, then discover a primitive looking pyramid on the planet. It was inside the pyramid where they would find the eggs. "And there were some changes made that were better," he added. "There were some improvements made." He noted the snappier dialog and praised Scott's visual flair. The director cited budget constraints as the reason he ultimately decided to jettison the pyramid. Of course, the pyramid idea returned many years later, in Prometheus. Ah, the glory days of practical effects. The eggs were stuffed with cow hearts and stomachs procured from a nearby slaughterhouse. The facehugger's tail was made with sheep intestine. This is one area where the world's vegans must praise CGI. From the cattle and sheep innards to the innards of Ash; the android's insides were made from pasta, caviar, and marbles, all covered in milk. Yuck. The actors were kept away as the set was dressed for the chest burster scene. Overalls, raincoats, tarps, and other precautions were undertaken for the massive amount of fake blood that would be spilled. O'Bannon said Sigourney Weaver looked a bit shaken when she stepped in and saw all of the preparations. Veronica Cartwright's shock was real. O'Bannon said she even fell backward and hit her head. Why does the Alien seem so lazy toward the end of the film? This wasn't a mistake. The ALIEN mythology as we came to know it was far from solidified at this point. Scott envisioned the creature's lifespan as relatively short. At one point, it would've started albino in color and gradually darkened through the course of the film, as it decayed and eventually died. Rather than an alien queen, the creatures would've reproduced by converting people into eggs. In the 2003 director's cut, Brett is seen mid-transition to egg. With Brett and Dallas turning into eggs, the Alien was in the end of its life cycle, hence its more stunted and sluggish movement toward the end.